Today is my second 'Rediscovered' post which is my aim to try and use the products that are collecting dust in my makeup draw. This time I have an applicator - the Real Techniques Miracle Sponge aka the best thing in my life. I got this from Cohorted back in November and reviewed it here, and one thing I complained about it was the fact that when you wet it and ring it out, the water is still trapped inside and you can feel it being all wet on your skin. So, the result was that I stopped using it; until a few weeks a ago when I had a ta-da moment and decided to bring it back out and use but this time use it dry. My life then changed forever, I prefer this over to using a brush and when I do use a brush I hate the finish. 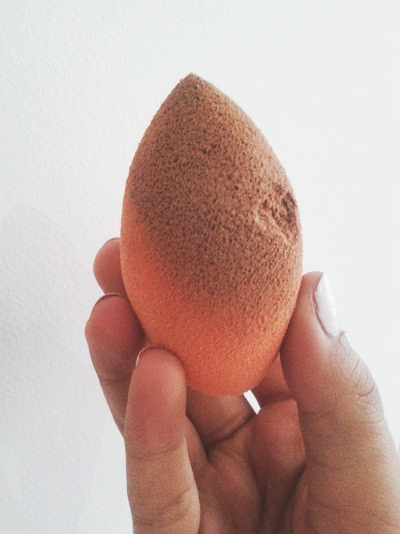 This sponge makes applying your base so much easier, it goes on smoothly, looks less cakey and feels as though it doesn't even exist on your skin. You can tell by the photos above that I prefer one side of the sponge the curved edge is much easier to use, I don't like the idea of the flat side as it makes no sense! And the tip is great for buffing in your concealer - double trouble! I took this sponge away this past weekend for some weddings and it worked a treat, double duty and easy to take along on the go. Have you tried this sponge?? Thoughts?